Although there was a dictum that the Byzantine solidus was not to be used outside of the Byzantine empire, there was some trade that involved these coins which then did not get re-minted by the emperors minting operations, and quickly became worn. Towards the end of the 7th century CE, Arabic copies of solidi – dinars issued by the caliph Abd al-Malik (685–705 CE), who had access to supplies of gold from the upper Nile – began to circulate in areas outside of the Byzantine empire. These corresponded in weight to only 20 carats (4.0 g), but matched with the weight of the worn solidi that were circulating in those areas at the time. The two coins circulated together in these areas for a time. The first dated coins that can be assigned to the Muslims are copies of silver Dirhams of the Sassanian ruler Yazdegerd III, struck during the Caliphate of Uthman. These coins differ from the original ones in that an Arabic inscription is found in the obverse margins, normally reading "in the Name of Allah". The subsequent series was issued using types based on drachmas of Khosrau II, whose coins probably represented a significant proportion of the currency in circulation. In parallel with the later Khosrau-type Arab-Sassanian coins, first issued under the Well-Guided Caliphs of Islam, a more extensive series was struck with Khosrau's name replaced by that of the local Arab governor or, in two cases, that of the Caliph. Historical evidence makes it clear that most of these coins bear Hijra dates. The earliest Muslim copper coins are anonymous and undated but a series exists which may have been issued during the Caliphates of Uthman or Ali. These are crude copies of Byzantine 12-nummus pieces of Heraclius from Alexandria. 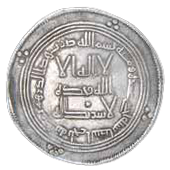 Silver dirham of the Umayyad Caliphate, minted at Balkh al-Baida in AH 111 (= 729/30 CE). By the year AH 75 (695 CE) Abd al-Malik had decided on changes to the coinage. A scattering of patterned pieces in silver exist from this date, based on Sassanian prototypes but with distinctive Arabic reverses. This experiment, which maintained the Sassanian weight standard of 3.5–4.0 grams was not proceeded with, and in AH 79 (698 CE) a completely new type of silver coin was struck at 14 mints to a new nominal weight of 2.97 grams. Unlike the contemporary gold coinage, this figure does not seem to have been achieved in practice. 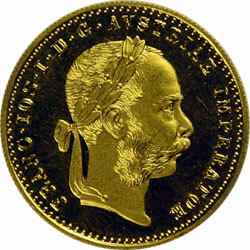 The average weight of sixty undamaged specimens of AH 79–84 is only 2.71 grams, a figure very close to that for a unique coin of AH 79 struck with no mint name (as was the standard procedure for the gold dinars produced in Damascus). These new coins which bore the name of 'dirham', established the style of the Arab-Sassanian predecessors at 25 to 28 mm in diameter. Their design is composed of Arabic inscriptions surrounded by circles and annulets. The gold coins were first struck to the contemporary standard of 4.4 grams and with one or more Arabic Standing figures on the obverse and an Arabic legend on the reverse. Dated coins exist from AH 74 and are named as 'Dinars'. These experimental issues were replaced in AH 77, except in North Africa and Spain, by completely epigraphical designs very similar to the designs adopted for the silver pieces but with a shorter reverse legend and no annulets or inner circles. This type was used without appreciable change for the whole of Umayyad period, the coins being struck to a new and carefully controlled standard of 4.25 grams. This weight was reputed to be based on the average of the current Byzantine solidi, was called a Mithqal, a term used earlier for ​1⁄72 of a ratl. Evidence of the importance attached to the close control of the new Dinars is provided by the existence of glass weights, mainly from Egypt. They usually show the governor's name, sometimes the date but all marked with coin denomination. The issues in gold from North Africa began as copies of the coins of Heraclius and his son (but with an abbreviated Kalima in Latin), the reverse "cross on steps" losing in most cases its cross piece. Dinars, halves and thirds were struck, all to the new weight standard. Later coins are dated by indiction, from Indiction II (AH 84–85) changing to the Hijra date in Roman numerals in AH 94 with Arabic phrases appearing in the field from AH 97. In AH 100, North Africa came into line with the eastern issues although the mint is named as Ifriqiya. The legends are shorter and the reverse has a new central inscription: "In the Name of Allah, the Merciful, the Compassionate". This was used also on the coins from Al-Andalus, and on the half and third Dinars, most of which show no mint but may well have been struck in Al-Andalus. Porteous, John (1969). "The Imperial Foundations". Coins in History: A Survey of Coinage from the Reform of Diocletian to the Latin Monetary Union. Weidenfeld and Nicolson. pp. 14–33. ISBN 0-297-17854-7. Wikimedia Commons has media related to Dinar. In the Middle Ages, the term bezant was used in Western Europe to describe several gold coins of the east, all derived ultimately from the Roman solidus. The word itself comes from the Greek Byzantion, ancient name of Constantinople, the capital of the Byzantine Empire. Mancus was a term used in early medieval Europe to denote either a gold coin, a weight of gold of 4.25g, or a unit of account of thirty silver pence. This made it worth about a month's wages for a skilled worker, such as a craftsman or a soldier. Distinguishing between these uses can be extremely difficult: the will of the Anglo-Saxon king Eadred, who died in 955, illustrates the problem well with its request that "two thousand mancuses of gold be taken and minted into mancuses". The miliaresion, was a name used for a number of Byzantine silver coins. In its most specific sense, it refers to a type of silver coin struck in the 8th–11th centuries. Sasanian coinage was produced within the domains of the Iranian Sasanian Empire (224–651). Together with the Roman Empire, the Sasanian Empire was the most important money-issuing polity in Late Antiquity. Sasanian coinage had a significant influence on coinage of other polities. Sasanian coins are a pivotal primary source for the study of the Sasanian period, and of major importance in history and art history in general. The Sylloge nummorum Sasanidarum is the most important primary work of reference for Sasanian coins.